What are Red Onions and Why is it suitable for you? Onion is purple, or as it is called red, or blue onion is a vegetable that contains many useful substances and has a beneficial effect on the human body. Culinary people often prefer this particular sort of onions, as it has a softer sweetish taste. Red onions have long been used not only in cooking but also in folk medicine. What is useful in red onions is that it is a storehouse of trace elements, vitamins, and minerals. The reddish-violet color of red onions is directly related to its usefulness and is determined by the high content of the pigment known as flavonoids. Red onions have a unique and complex chemical composition that determines its medicinal properties. The maximum concentration of nutrients (about one third) is concentrated in the upper layer of the bulb under the husks. Red onions contain antioxidants, plenty of vitamins A, C, E, H, PP, B1, B2, B5, B6, B9, strong essential oils and more than 20 chemical elements (sulfur, potassium, iron, sodium, phosphorus, chromium, etc.). Some useful substances red onions contain in more quantities than other foods from our diet. Health benefits of red onions are due to these chemicals and microelements, which are contained in its composition. So, for example, antioxidant compounds prevent oxidative processes in the body, prolong the youth of the skin and tissues of internal organs, remove radionuclides and cholesterol. Sulfur – 65 mg per 100 grams of product. It is of great importance not only for health but also for beauty, because it stimulates the natural production of cysteine. This amino acid removes toxins from tissues and stimulates the production of collagen – the main component of healthy nails, hair, and skin. Useful properties of sulfur are also important for those who want to get rid of obesity. Sulfur is necessary for the prevention of atherosclerosis, it improves the cleavage and excretion of cholesterol and prevents the formation of triglycerides, which are one of the main causes of excess weight. Sulfur maintains the cardiovascular system, improves blood composition. Chromium – 42 mg per 100 g of product. Far from being the highest chromium content indicator, but most of the products we use do not even have this share. This micronutrient is very important for health because its deficiency is one of the causes of diabetes. Chromium helps reduce blood sugar, makes cells more susceptible to insulin and reduces the likelihood of developing type 2 and type 1 diabetes. Anthocyanins. These are specific plant pigments with a strong antioxidant property. Red onions like no other can protect people from the appearance of cancer, experts say. Fresh red onions effectively contribute to the death of cancer cells due to the fact that it contains a lot of antioxidants quercetin and anthocyanin. According to clinicians, it is the anthocyanins that stain the bulbs (and many other fruits). These natural pigments are compounds dissolved in the cell sap of plants. The human body can not synthesize these substances – they can only be obtained with food. Anthocyanins are powerful antioxidants: they bind free radicals and prevent premature aging of the cells of internal organs. 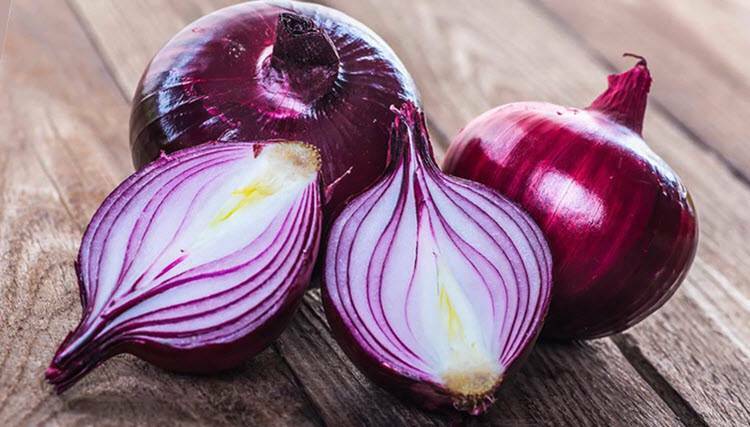 The researchers note that in red onion, the concentration of these substances is such that this product turns out to be a real “killer” of cancer cells. In addition, they slow down the aging process in the body. It should be noted that the use of this culinary plant can prevent the development of cancer of the larynx, ovaries, esophagus and large intestine. Quartzitin is an excellent antihistamine and diuretic. This substance has anti-inflammatory, antispasmodic, antitumor and radioprotective action on the body. Red onions are a natural antiseptic. Onion juice disinfects (with an external application), kills germs and viruses inside the body. Vegetables strengthen immunity. Used in folk recipes for the prevention and treatment of colds, bronchitis, pneumonia. Several tablespoons of juice a day are useful for the acidic environment of the stomach. Red onion is effective in secretory insufficiency. It also helps to improve metabolism. As a result, digestion improves, so it is often used in the daily menu of people with obesity. Important! Especially rich in antioxidant flavonoids the upper layers of onions. Therefore, it is necessary to clean it with caution, remove not more than one layer, in order to preserve as many useful substances as possible. The removal of one, juicy, outer layer leads to a loss of 20% of quercetin and more than 75% of its anthocyanins. It is necessary to remove only the dry top layer – the husk in order to ensure the complete safety of the elements beneficial to health.